Oh, little fishies. A lot of us have made the false assumption that fish are an easy, low-commitment, "starter" pet — only to have the illusion shattered by the death of a beloved little swimmer. Keeping a pet fish from an early demise and the big flush seems impossible, but the source of your heartache could all come down to the species you have in your tank. While some fish species require more care than others, there are several types that are remarkably low-maintenance. What makes a fish easy? As a fish owner, I can tell you there’s a lot more that goes into the care of fish than you might think. Life happens, you get busy and those fun little fish tend to take the back burner. If you’re looking for a low-maintenance fish, choose one that’s hardy. Look for a fish that can handle a little overfeeding (because how much is a "pinch, " really?) or a little underfeeding (oops). You’ll also want a fish that can stand less-than-frequent water changes, because who has time for that? Finally, you’re going to want a fish that’s peaceful. Take my word on that one — after spending all day keeping my children from killing each other, the last thing I want to do is break up a fish fight. Not to worry — we won’t leave you high and dry in the fish aisle. We went straight to the experts to find out which fish are the most no-fuss. These are the simplest fish to keep. According to Nick Saint-Erne, D.V.M., Certified Aquatic Veterinarian, resident PetSmart veterinarian, the easiest and most popular starter fish is the Betta. They’re the only fish that don’t require a filter or heater and can be kept in small bowls. The only real maintenance you’ll face with these guys is a 25 percent water change once a week. 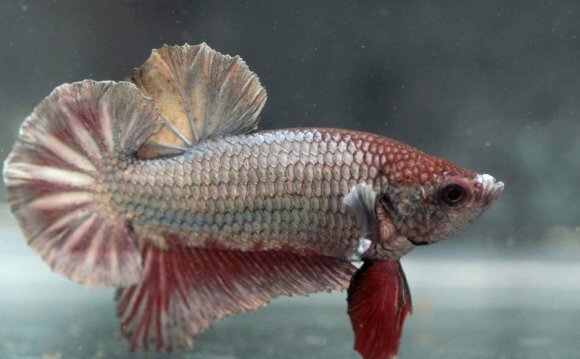 Bettas have gotten a bad rep, as their nickname, "the fighting fish" suggests. While it’s true you can’t house more than one male betta in the same tank, that doesn’t mean they have to live solitary lives. "They can be kept with other similar-sized fish of different species in a larger aquarium, " says Saint-Erne.